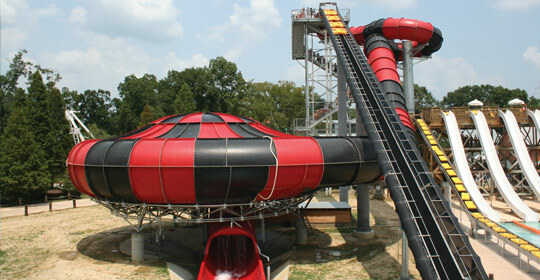 Van Stone Conveyor, Inc. has engineered over one dozen firsts in the Amusement and Waterpark industries. With over 300 installations around the world, Van Stone is the recognized leader in innovation, quality and service. Our conveyors operate in more than 150 unique systems, throughout 9 countries and 5 continents. Over the last ten years, we have established a 90% market share. Our expertise in conveyor systems has propelled Van Stone Conveyor, Inc. to lead the world in providing conveyors designed specifically for use in the Amusement and Waterpark industries. In 1991, a surprising phone call opened up exciting possibilities for Van Stone Conveyor, Inc. That phone call came from a local waterpark in Southern California. A new ride that incorporated a family raft required a new solution. The Van Stone team went to work and immediately discovered several problems with existing conveyor systems in use within the waterpark industry. Existing installations had simply adapted packaging conveyors to move tubes, and we found that adaptation used unnecessarily complicated and poor materials for the rigors and hazards of waterpark conveyor systems. Our initial design made use of galvanized structural steel frames, stainless steel slider-bed and heavy duty mine-grade machinery. That first design still operates today with virtually all original parts! The company’s success with their first design permanently changed Van Stone Conveyor business. For nearly two decades, we have designed conveyors exclusively for the waterpark and amusement industries. Our clients include indoor and outdoor waterparks, resorts and hotels, amusement and theme parks, and various aquatic facilities. We have built strong relationships with the industry’s largest and most awarded slide manufacturers. Commitment, design quality, and expertise have led Van Stone Conveyor, Inc. to become known as The Most Trusted Name In Waterpark Conveyors. Not satisfied simply leading the industry, we continually innovate. Our design team welcomes your unique ideas and most challenging projects. When you need something moved, Van Stone Conveyor, Inc. will enthusiastically draw upon their wealth of experience or happily produce yet another first.